Last August, as the steam gathered behind the national sentiments of anger following the death of Michael Brown, I kept waiting for the moment that something or someone was going to grab the reins and take it to the next level. As the hashtag #BlackLivesMatter emerged and assumed a life of its own, I kept waiting for the moment that I would see some coalition building across the geographical areas and honestly, maybe seeing some sit-ins and some demonstrations and a list of demands, real demands emerge. It never did. I went home for the holidays and went over a family friend’s house for Kwanzaa, a tradition that seems to have been birthed in my early childhood and has truly grown and expanded beyond what I could even imagine, and I brought this up with close family and friends asking “Where is the movement?” I kept hearing a lot of people describe things in motion, but I never heard a movement. In cities across the country I watched churches and other groups march from here to there carrying signs, and I also saw them do it with police protection as they gathered or walked. Something about that just didn’t sit right with me. I kept searching for the end-game as I watched these rallies. While people could print t-shirts that read “I Can’t Breathe” (the famous last words of Eric Garner) or construct placards with “Black Lives Matter” on them and show up at a time and place and join a rally of like-minded people, for me that does not constitute a movement. I wrote an open letter to the Church of God in Christ, the historically black Pentecostal denomination, asking that they stage a protest in St. Louis last November as their annual convention was taking place a mere 12 miles from protests in Ferguson. Suffice it to say, they focused on other things. Part of that open letter stemmed from the fact that I was yearning for some type of coalescence around a few good actionable ideas. As the conversations around police wearing body cameras came about, I remember thinking that this is a pretty simple demand and that protests be geared for something like this: demanding a state legislature mandate that all police departments across the state have body cameras within the next three years. Again, I never saw that either. It bothered me that I never saw, and still haven’t seen, any tangible actions emerge from this so-called movement. It bothers me because while I agree with the sentiments and the ideologies of Black Lives Matter, I can’t see how any of it has any staying power. And by staying power, I don’t see it as a change agent for the revolution of the system. One of the reasons the protests surrounding the Jena 6 were so effective was because there was a very clear goal: the charges against Mychal Bell and others need to be reduced from attempted murder and they need to be tried as juveniles, not adults. And simply, the protests ended after that goal was accomplished. Part of the issue with the protests surrounding Black Lives Matter is that the name itself isn’t an actionable phrase nor is it easily accessible phrase to the masses. In the not so distant past we’ve seen instances of citizens founding movements, political and cultural in nature that don’t fall into the trap of Black Lives Matter. One of the earlier one’s from this time period was the Christian conservative movement of the Moral Majority. While I fundamentally disagree with the politics and found that their ideologies stands in direct opposition of black lives mattering, their organization and mobilization is worth noting. For one, they had a generic name that allowed accessibility of the masses. Inherently, words like “moral” have a wide appeal and in a populist culture, who doesn’t want to be part of the “majority.” This was part of why the Tea Party movement actually has a few wins in their column. The Tea Party, unlike the sentiments around Black Lives Matter, understood what leadership could do for a movement. The energy behind the Tea Party allowed them to crown political popes like Glenn Beck, Sarah Palin, and even regular citizens like Joe the Plumber to be titular figureheads as use outlets like that of Rush Limbaugh and Sean Hannity to spread their ideology. The recalcitrant and oft repeated thinking that Black Lives Matter is a “leaderless movement” is the example of cognitive dissonance over what really is required of a movement. Their effectiveness is also helped by the singular anti-focus on Barack Obama. From the moment he was sworn into office, there was a contingent that was laser focused on opposing his every turn. Even when the move to make him a one-term president failed, the ways in which they assumed office with each mid-term election completely flipped congressional control from blue to red. 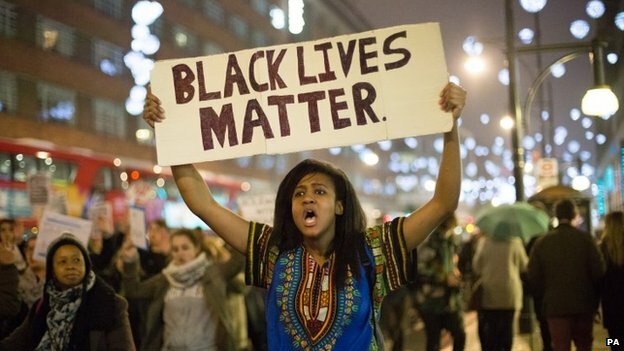 There is no laser focus associated with Black Lives Matter. From one moment it focuses on police brutality and the next moment it’s focused on the broad problems associated with poverty. Part of what makes a movement is that there is an end goal by which the motions are moving toward. In 2008, Barack Obama did something that the country hadn’t seen since the Moral Majority buoyed Ronald Reagan to re-election in 1984 and formed a political movement from one of the country’s major two parties. The sheer mass of people who came together to vote for him was simply astounding. “Yes we can” was a rally cry that allowed for a rainbow coalition of people from varying walks of like to get what that meant and to be a part of that “we.” Rightly so, the conservatives tried to punch holes in such a nebulous slogan, but at the end of the day, you can’t take away the good feeling that saying “Yes we can” provides. Chanting “Black Lives Matter” is a statement of anger. While anger can fuel protests, anger doesn’t have the emotional sustainability for a movement. To declare “I can’t breathe” is echoing the death knell of people who are about to expire and they don’t exist as life-giving words that can propel the inner-workings of a movement. The righteous indignation of Black Lives Matter is very righteous; a noble ideology whose consciousness is revolutionary in and of itself. However, the problem with it is that it requires a type of creative rhetoric that refuses to engage the masses for the sake of what appears to be personal aggrandizement. I think it’s hard to say that the leaderless leaders of Black Lives Matter are in it for themselves, but it does bear questioning just how much are they in it for the long haul. Not having institutional buy-in with Black Lives Matters creates a space where people can fill up TV and radio time to make monuments unto themselves while still claiming a movement. Part of this has been performed in the way the institutional Black Church has not been involved tangibly in Black Lives Matter. While there are numerous black churches across the American urban landscape who have been on message about the ideology behind it, none of them have made the next step in laser focusing on very specific issues in the communities from which they are located. It stands to reason, however, that many of these churches have already been doing some of the work prior to last summer and they may very well continue doing that work, but none of them have emerged on a national level leading the charge. My ultimate disappointment with Black Lives Matter is that it doesn’t require people to change their level of consciousness, it only asks them to do so. Hashtags and tweets to hundreds of followers only goes so far, most times its preaching to the choir. Personally, I support hashtag activism because it is a way in which one can display personal sentiments. But at the same time I recognize that a hashtag doesn’t have staying power. While yes Black Twitter has had the power to actually get someone fired from the job, at least up until this point, it hasn’t displayed the power to effect systematic change. Social media operates on the notion of partial anonymity and anonymity is not the hallmark of a movement: a movement needs a face. This is why the comment sections on message boards and trolls flourish; they are disembodied thoughts that float throughout the ether seeking whom they may devour. But the inverse is true as well, making a difference still requires the individual to personify themselves. Tweets and Facebook status updates don’t have the power to be sacrificial lambs; none of us can truly embody that black lives do matter if the only thing we offer up to sacrifice is our timelines. This millennial generation that I am a part of seems to be more interested in claiming a movement with only less than 12 months of motion. There seems to be a strong desire to stand in the tradition of the modern civil rights movement, yet divorce themselves from the institutional structures that supported that movement. This dissonance exists because of the ways in which larger-than-life figures such as Jesse Jackson, Charlie Rangel, Bobby Rush, Al Sharpton, Andrew Young and others who exist on the local level have stood as impassable gatekeepers preventing institutional access favoring respectability speeches toward the youth rather than giving them tools of empowerment. Rather now, we have a class of leaderless leaders in this generation who have inherited the wind; standing as gatekeepers to transient institutions whose building blocks are hashtags, retweets and likes. Black lives mattering is bigger than social media. It always has been, and it would do good for more people to realize that. Social media is merely a tool to advance that ideology, it isn’t the movement itself. Twitter strategies only go so far in the furthering of a goal, but as I’ve noted before, these protests have no real goal behind them. It exists to memorialize the ones who have fallen by the side of the road either physically or spiritually as a result of institutional racism that fails to see that black lives matter. For me, right now, Black Lives Matter is nothing more than the upheaval of lament and therefore it does have it’s place. However that place is not as a movement, just a prolonged moment. You make an interesting point about needing a name that invites the masses. The Human Rights Campaign is another good example of that. I was sad to see people fighting over “Black Lives Matter,” trying to correct it to “All Lives Matter” – which is a great sentiment, but waters down the critical problem of police brutality against Black men and the legal system’s biases against them. I was wondering, too, if you have any suggestions for actionable goals. Not that you have to – the analysis you’ve done here is important in its own right. Another strength of the Moral Majority and the Tea Party, however, is that they were both started top-down by moneyed and powerful people. Is that possible for a progressive cause? Is it desirable? I don’t know the answers to those questions, but I think they’re worth discussing. I personally support the awareness that “Black Lives Matter” brings, but national movement making it is not. There are some other organizations, that I didn’t list (and probably should have), such as Dream Defenders off the top of my head that are doing some “boots on the ground” when it comes to organizing and making some notable impact. I think actionable goals should be about determining what legislation can be preventative when it comes to police brutality and policies in place that have some teeth behind them when it comes the burden of proof for police officers killing unarmed citizens. Additionally organizations that identify those with deep pockets when it comes to funding local community projects that we know can have a way of bettering local neighborhoods and citizens. Ideally, it would be nice to see persons of this generation enter local elected offices such as council members in their local municipalities. That was my question. What can we do to turn this into a movement into something that is an angry lament to a lot of people. How do we manifest a power that we know we have. Maybe we can bring this to the general election, to chang laws on a federal level. It is encouraging that South Carolina Dixiecrat Strom Thurmond’s son Paul (with an outside half-black older sister) stood up to the bigotry and hatefulness represented by the ‘rebel flag’ (symbolic and real) that for most blacks and many whites want to be gone (over and done with, equal protection under the law). Now. Hang in, hang on, uppity matters as does education for all. Conscious raising sound dated, but it is real. Speaking truth to power is progressive on a level that provides strength for the struggle. I definitely agree that for all the protesting and discussions, a movement was not made. However, I think it’s also important t note that the Millennial generation doesn’t understand movement making. They are far removed from the movements of the past (Civil Rights, Black Power etc.) and what is taught about it is more of a superficial glamorized summary that often neglects the most significant points about them that could offer guidance. The other thing is that we are living in a different era than the historical movements of the past. The way that the Ferguson protests and Black Lives Matter campaigns surfaced and gained momentum was unique. Because of that identifying how to take things to the next level will be no simple task and it will take trial and error. Couldn’t aree more. This generation, myself included, don’t know how to start a movement in a true sense of something that has widespread grassroots involvement. But it’s also acknowledging that the ways in which movements were mad before can’t be done again. I’m not sure what its gonna take to get to the next level. I met with one of the sisters (Alicia Garza) who started Black Lives Matter, and think she would agree with what’s being said. She was in search of the linkage between the generation of activists and her generation. They want that guidance from elders (without being usurped from their movement). We need to reach out as the elders. Its funny. Oprah Winfrey said the same thing you just said and she got killed for….well, for being Oprah. She promptly shut her mouth after that. If you’re scoring at home Black Twitter 1, Reason 0. Uppity at its finest. The 18 minutes, IMO, is well worth it. Personally, I think it’s one of two things or perhaps a combination of both. 1. The idea of putting a face to the movement runs the risk of limiting the movement to that one person in narratives of the following years. An example would be Dr. Martin Luther King Jr. and the Civil Rights movement. He was regarded as the face the Civil Rights and because of that, the other leaders like Coretta Scott King Jr. and Bayard Rustin were pushed to fringes. Subsequently, when Dr. King Jr. died, the narrative communicated that his death was the end of the movement and story, and everything was accomplished. 2. Another possible reason deals with what you said about some people not being in it for the long haul. There might be some truth to it because anyone that has looked at the history of black activism and resistance to white supremacy can see several examples of black gaining a level of independence and power yet watching that independence and power get destroyed by greater forces. (Black Wall Street, Seneca Village, current moments of gentrification). There comes a moment when someone may feel that these efforts are meaningless in the back of their mind, and they don’t want their efforts to go to waste.